Most of us aren’t willing to tackle the cooking of a whole hog, though it’s one of the most appealing outdoor cooking methods for serving a group. Fortunately, chefs are serving up pigs roasted in pits, on spits, and in the smoky mouth of an horno. Here are two coming up on July 4. “And the problem is?” I wanted to ask. I saw her point, but I wasn’t about to concede it. I argued that the flavors of the Southwest are the flavors of outdoor cooking—the bold use of spices and the whiff of sultry woodsmoke, grilled beefsteaks crustily seared, smoldering spit-roasted cabrito fragrant with fresh sage, the sizzle and smoke of pork at a community matanza. Summer vegetables such as corn on the cob and potato wedges take to fire and spice. Even my editor’s beloved clams and oysters got a lick of heat with the addition of chile. She came around, and in the book’s intro, we agreed to add a line about this mania of mine for the essence of the place I call home. Instead of just taking the same old sauce or rub and slathering it on everything, think about what flavors truly go best together. Fire up your summer fare with this new approach, redolent with the aromas of New Mexico. Pork, that most traditional of barbecue meats, benefits best from classic barbecue flavors, including the tangiest and sweetest of blends. Beef, because of its inherent assertive taste, should be seasoned boldly, usually in a savory fashion (though burgers can handle a hint of sweetness). Lamb and cabrito (young goat) can take strong flavoring like rosemary, cumin, and sage. Poultry perks up from mellow wet or dry mixtures under the skin. Vegetables and fruits show off their best sides with the benefit of heat, smokiness, and tang. Whether you’re firing up the grill or smoker for a graduation, Father’s Day, or simply to celebrate that summer’s finally and officially here, these recipes will get you started. They are adaptations from my newest book, The Barbecue Lover’s Big Book of BBQ Sauces: 225 Extraordinary Sauces, Rubs, Marinades, Mops, Bastes, Pastes, and Salsas, for Smoke-Cooking or Grilling (Harvard Common Press). Written with my husband, Bill Jamison, the book makes a great summertime gift. Order it from the New Mexico Magazine Store (mynm.us/nm-shop). The Savory Spice Shop branch in downtown Santa Fe is a great place to purchase many of the herbs, spices, and other seasonings called for here, like black garlic. They really stock up for the barbecue and grilling season, and have a robust assortment of Southwestern flavorings. The store is at 225 Galisteo; mail-order at (505) 819-5659 or savoryspiceshop.com. 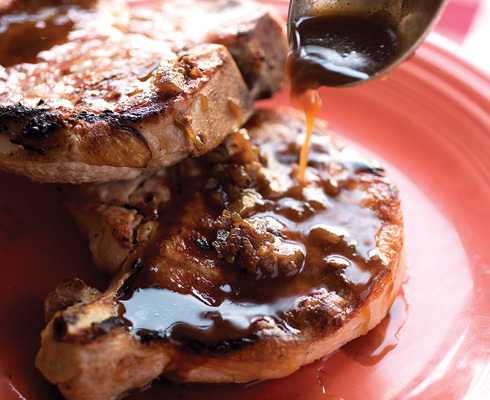 This finishing sauce will wake up your taste buds whether you are grilling a pork tenderloin, quick-smoking a half-dozen pork chops, or barbecuing a pork shoulder. Warm oil in a small saucepan over medium heat. Stir in onion and cook until it begins to soften, about 5 minutes. Add coffee, brown sugar, corn syrup, chile, cinnamon, and salt to taste. Simmer until mixture is reduced by about one-third, about 10 minutes. Whisk in butter. Serve sauce warm with pork. You can also store it in a covered container in the refrigerator for several weeks, but reheat it before using. Swoosh this over a grilled pork tenderloin or some chops. Hops add the pleasant bitterness to beer. It’s the panicles, dangling from hops vines like mini-lanterns, that are used for the flavoring. The panicles can also be added fresh to the butter for more savor, and as a novelty to many guests. I grow hops in my yard for the panicles, but they can be found at many farmers’ markets these days. Skip them, though, if not easily acquired. Pour beer into a saucepan and add hops and garlic, if you wish. Over medium heat, reduce mixture by half. Reduce heat to low. Whisk butter into sauce, one piece at time, until all of it is incorporated. Sprinkle in salt to your taste. Serve warm at the table, on or alongside grilled pork. Juan Bochenski, executive chef of Santa Fe’s Rosewood Inn of the Anasazi, is a native of Buenos Aires. 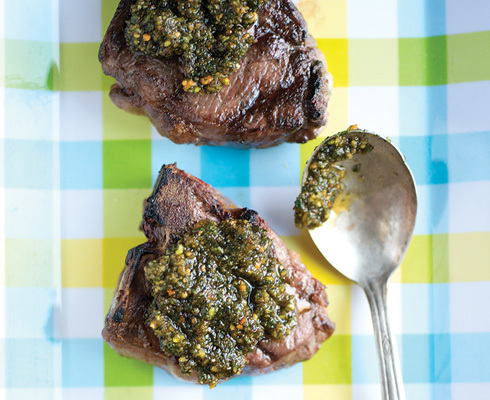 He whips up all kinds of tangy chimichurri herb sauces, Argentina’s favorite accompaniment to steak. You can count on them being delicious, but beyond parsley you never know what might show up in the oil-and-vinegar-based condiment. He inspired my take on chimichurri here, where a trending culinary ingredient called fermented black garlic is used to flavor the sauce. Black garlic has a milder, sweeter flavor than regular garlic, and a jelly-like consistency to the cloves. 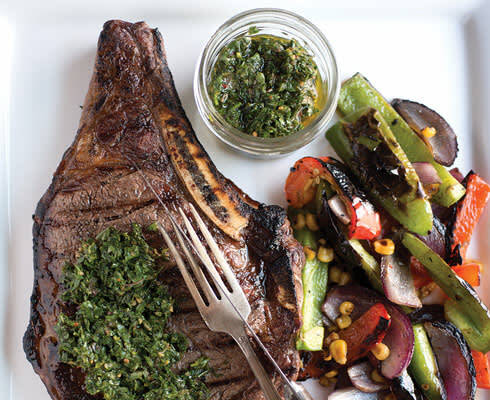 Let chimichurri mellow in the fridge for at least a few hours, and preferably a day, for the flavors to meld. Lavish as a finishing sauce over any grilled cuts of beef or bison. Whisk together vinegar, water, and salt in a bowl. When salt has dissolved, whisk in garlic, parsley, oregano, mint, and chile. Then whisk in oil. Pour the sauce into a covered container and refrigerate for at least 3 hours or up to 2 weeks. Serve chilled alongside meat for guests to enjoy to their taste. Fry bacon in a large, heavy skillet over medium heat, stirring occasionally. When bacon is brown and crisp, after about 15 minutes, remove it with a slotted spoon, drain on paper towels, and reserve. Pour off and set aside for another use all but 2 tablespoons of bacon fat and stir onion into fat that remains in skillet. Continue cooking over medium heat until onion is soft and translucent, about 7 minutes more. Stir in garlic and cook for 1 more minute. Pour in vinegar and scrape up mixture from bottom of skillet. Add coffee, brown sugar, agave nectar, bay leaf, and reserved bacon. Stir well. Turn heat down to low, cover, and simmer for about 1 hour, stirring occasionally, until very thick and jammy. Remove bay leaf. If you wish, purée about half of jam in a food processor and then stir it back in. Use warm, dolloped over burgers, or store in a covered container in the refrigerator for up to 10 days (reheat as needed). Dry rubs or seasoning pastes make excellent flavorings for poultry. Try this under the skin of chicken, quail, or duck destined for the grill. Shelled pumpkin seeds, known commonly in New Mexico as pepitas, make a good, mild base for a seasoning paste. Pumpkin-seed oil will further enhance the sweet, earthy quality of the pepitas, but olive oil is a fine choice here, too. Place garlic cloves in a small, heavy skillet. Over medium-low heat, toast the cloves until softened and lightly colored, 6 to 8 minutes. Drop the garlic cloves into a running food processor and mince them. Stop processor, put in the pepitas and marjoram, and process until finely chopped. With processor still running, add oil. Add cumin and salt and pulse an extra time or two to incorporate them. Use the paste within 1 day of making for best flavor. Rub paste generously on poultry, massaging it over and under the skin. Allow seasoned poultry to sit for at least 30 minutes at room temperature, or up to a few hours wrapped or covered in refrigerator, prior to cooking. Just outside Alamogordo sits one of those iconic roadside attractions, the World’s Largest Pistachio Nut, heralding your arrival at McGinn’s Pistachio Tree Ranch. If you’re in the neighborhood, stop for a nutty selfie, then pick up some tasty pistachios, too. They yield scrumptious creaminess when turned into pesto. This one was crafted to accompany grilled lamb, but it’s also good with fire-seared venison. Place pistachios, mint, and garlic in a food processor. Process until finely chopped. With the processor running, pour in lemon juice and then oil in a slow, steady stream. When well combined, add chiles and salt and process again. Taste to see if more salt is needed. Use the pesto at room temperature, spooned over lamb. To store leftovers, top remaining pesto with a thin film of additional olive oil, cover, and refrigerate for up to 3 weeks. This citrus-and-chile-spiked dressing shouts ¡fiesta! for grilled tomato halves, corn on the cob, onions, bell peppers, or plump green chiles. Whisk together vinegar, lime zest and lime juice, and shallot in a bowl. Let mixture stand for 10 minutes. Whisk in oil, add chipotle and adobo sauce, and season to taste with salt and pepper. Serve right away to accompany grilled vegetables. Cheryl Alters Jamison is New Mexico Magazine’s contributing culinary editor. Read her blog at nmmagazine.com/tasting-nm-blog. You can order her latest book, The Barbecue Lover’s Big Book of BBQ Sauces: 225 Extraordinary Sauces, Rubs, Marinades, Mops, Bastes, Pastes, and Salsas, for Smoke-Cooking or Grilling, from the New Mexico Magazine Store at mynm.us/bbqsaucesbook.